NetEnt’s upcoming Max Series to cater to casual and high roller slots players. NetEnt is always looking to diversify its online slots portfolio. The brand has been pioneering innovative creations for more than two decades. The latest announcement from the Swedish games developer indicates another upcoming success on the digital horizon. They call them Max Series Slots. This new series of online slot machines are a special breed. Twins, so to speak, with only slightly varying qualities to tell them apart. The first edition is a low volatility slot machine with all of NetEnt’s usual features and aesthetic appeal. The second Max version is incredibly similar to the first, in almost every way except that its mechanics are altered to deliver higher volatility; thus, higher potential for big wins. The beauty behind NetEnt’s engineering is that the games in the Max Series should appeal to every type of slots player. Those who prefer low stakes and equally low volatility slots—casual players—will find the standard edition of these games most gratifying. They are low-cost games that frequently land small payouts, perfect for keeping a player’s bankroll stocked through a long session. Big spenders rarely play those types of slots, though. They aren’t looking for the consistent chime of bells and whistles. They are seeking one thing, and one thing only—a big payout. And they don’t mind funneling a bit more cash into a machine to find it. As such, they are drawn to high-volatility slots, and that’s exactly what the Max edition in the new series brings to the table. NetEnt reports that each dual-edition will share similar RTPs and game mechanics, giving NetEnt casinos the chance to promote near mirror images of the games for all types of players. The first titles on the pending roster of this innovative new slots series are called BerryBurst and BerryBurst Max. They are set to launch just four weeks from now, on August 23, 2018. A NetEnt Official promo video for the Max edition reveals a super fruity graphic overlay with a tropically groovin’ soundtrack to match. Not all of the features are revealed in the teaser—hence the name, teaser—but it’s clearly charged with expanding wilds and sticky wild respins, adding to the lucrative nature of the game. Kudos to the development crew at the Stockholm-listed software firm for once more doing an amazing job fusing all the qualitative parts together to deliver yet another sure-to-be crowd pleaser. 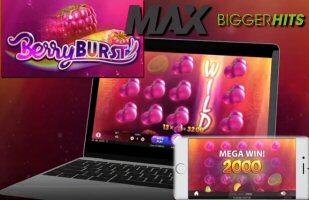 Mr. Fagerlund is among the biggest fans of the new Max Series Slots, commenting his positive enthusiasm for yet another immensely successful launch to their already immense portfolio of digital online and mobile slots. “We are certain that the MAX releases will add another dimension to our already hugely popular portfolio,” said Fagerlund, adding that the upcoming launch will no doubt “increase the standard of the gameplay experience” for casual and high-roller slots player alike.